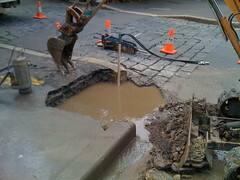 Walking past where the marking I noticed the other day was, this morning I found a rather large hole filled with water. 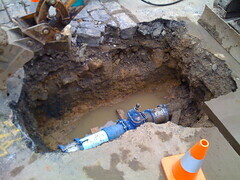 The Water Board had dug down to the pipe that needed fixing. Although, without all that dirt packing it in it was leaking even more. Their next job was to replace the valve. Coming past in the afternoon I see they had finished the replacement. Down the hole was a nice shiny new blue and silver valve. From a conversation I had with one of the workers, it appears that the old sandstone footpath edge had been send to where footpaths go to die. And that it was the councils job to replace it. Now to wait for the hole to be filled in again. This entry was posted in Photos, Social and tagged construction, photo, Sydney, water, witches hat. Bookmark the permalink.